If you are in Southern California and wish to treat your mom to a special brunch this year, you should book the scrumptious Mother’s Day Brunch on the Queen Mary. Considered the most elegant ship of her time, the ship has five dining rooms and lounges as well as a stunning wood paneled Grand Ballroom. The magnificent ocean liner built in Scotland sailed its first voyage in May 1936 from England’s port of Southampton. During WWII the ship was ‘enlisted’ to help with Britain’s on-going war efforts. After WWII ended, the Queen Mary was retrofitted to civilian service and continued her service from another eighteen years. On December 9, 1967, the Queen Mary arrived at her destination in Long Beach California where she became a floating attraction as well as a popular dining and event venue for tourists and locals alike. 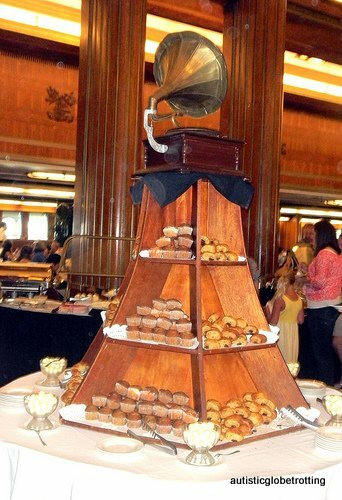 The Queen Mary Champagne Brunch is popular Mother’s Day with many families as the restaurant can accommodate large groups so early reservations are a good idea. We went last Mother’s Day and had a great time. 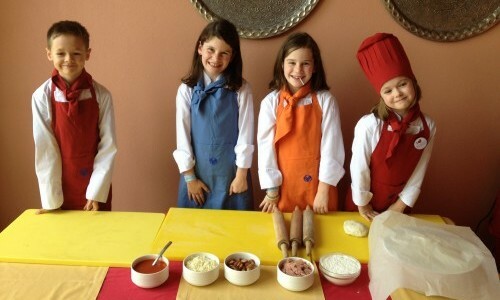 Like on a real cruise ship you are welcomed at the entrance by the Maître D’ and the dining room staff. Entering the wood-paneled Grand Salon you truly feel you are stepping back in time to the golden era of ocean liners. The buffet is placed in the center of the room in a circular shape to avoid long lines of guests waiting to access the food which is a blessing especially around midday when the room is filled to capacity. Apart from the customary omelet station and American breakfast staples area, the champagne brunch also boasts an ample carving station with prime rib, honey baked ham, turkey and lamb. The brunch features dishes from the many countries the ship visited during its voyages like Italy (traditional Italian wedding soup, various pastas and all-time favorites salads like Caesar and Caprese) , Mexico (Chile Tacos and the obligatory tortilla soup) and China (Sesame Chicken, Shanghai chicken salad and Hot sour soup) . 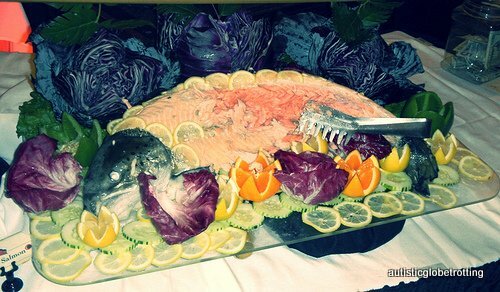 Our favorite section was the ‘ocean bounty’ that displays scrumptious crab claws, smoked salmon, seared Ahi, shrimp and fresh shucked oyster platters. The highlight is the poached Salmon Serpentine that according to the travel channel interview with the chef is based on the original 1930’s recipe that was on the ship’s menu. For the sugar addicts , the patisserie table is loaded with filled cupcakes, éclairs, tarts, cakes and macaroons (best I’ve had outside of France) However, we all agreed the highlights were the ready-to-order crepe Suzettes with the Sundae Bar and its plethora of toppings a close second. If you are dining with young kids they’ll probably head straight to their kids’ buffet decorated with stuffed animals and tacked with the usual macaroni and cheese, chicken nuggets and fries. To avoid waiting to be seated (the place can be packed at times) you might want to book your brunch either early in the day (they open at 10 AM) or close to closing time (1:30 PM). If you wish to take a tour before or after the Brunch be sure to book it in advance since the ship is a popular destination for families on Mother’s Day. You can ask for their Gluten Free Casein Free options if you call ahead of time. If your child is noise sensitive ask for a table away from the music and dancing that be loud at times. The Russian cold war era submarine form nicknamed “terror of the deep” is fascinating to explore and learn how the people lived and worked on board. Learn about the important role the ship had in transporting troops to and from battle fields during World War II. 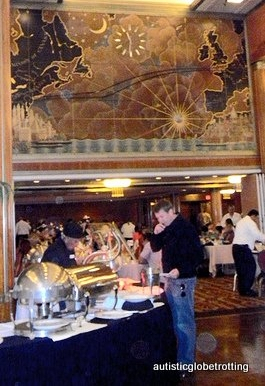 The tour provides a behind the scenes informational journey of the ship focusing on the glamorous cruise lining years. A complete overview of the ship’s haunts including the ‘lady in white’, a sailor who died in the engine room and even kids who drowned in the ship’s pool. Famous for her charity work and timeless style the exhibit showcases personal items and historical artifacts related to the late Princess of Wales. Say Cheese: Where Are the Cameras on WDW PhotoPass Attractions?